When thinking brings pleasure. When thinking brings pleasure? : Searching For Visionaries! This post is a copy of an update from my (failed :( ) GoFundMe campaign. This update is about a vision. A visionary is not the one who can see things farther away than others, nowadays everyone can utilize binoculars or other instruments to see things afar. A visionary is the one who can see NOW, what others will see much later. And again, nowadays there are tools which allow everyone to be a visionary. I am not a visionary. Even if I see something still hidden for many, it is because I am standing on (stealing from Sir Isaac Newton) “the shoulders of giants”. The power of a random walk generated by a social “Brownian motion” has led me to my current position. My diverse experience allowed me to compose my views. Now I am using my professional website www.GoMars.xzy, my personal blog, and my fundraising campaign https://www.gofundme.com/teachology as “binoculars” which all people could use to see what I see. I am looking for people who are with me on the path for transforming education by transforming the science of education. But I would never consider as enemies people who do not share our view. Recently I wrote a short letter to a high ranking Boston University official. Despite my expectations, he responded with a thoughtful letter, doubting the need for a science of education (and some other views). Obviously, I cannot post his letter, but below is my response to him, which also can be applied to any institution, organization, or an individual. 1. First I want to express my gratitude for you finding time to read, to think and to respond. My informal statistics shows that out of 20 people who received my email 16 would not react at all, 3 would send back something trivial like “thank you”, or “good luck”. One writes something thoughtful, like you did. I truly appreciate your time. 2. 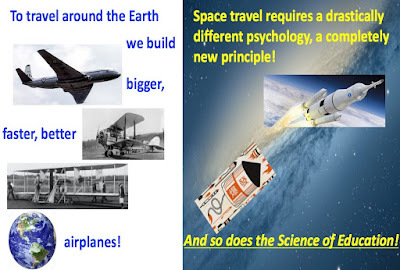 If we want to travel from one place on Earth to another place on Earth as fast as we can we use an airplane. Trying to do it faster and with more comfort, with more people on board, and less fuel spent, we make plains better and better. However, no matter how good we are at making airplanes, if we want to travel in space we have to completely change the approach. 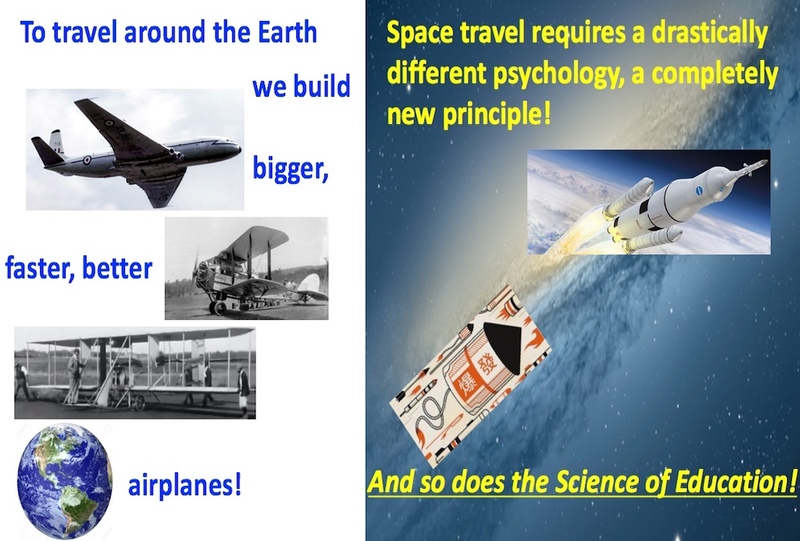 First, we have to change our own psychology, we have to want to travel in space, we have to believe it is possible, and then we have to find a drastically new principle which could be used for building “space planes” (a.k.a. rockets). And this is just a beginning of the new approach. Using this analogy, I say that currently everyone involved in education – in any/every role! – is trying to build better airplanes. I want to build a rocket. The project will not address any current issues in education any soon, and that is why almost no one feels any attraction to it. Which brings me to my current actions. I am not really looking for any funding (yet), I am not trying to convince anyone that I am right. I am looking for people with whom my view resonates. I am not the only one who (a) states that a science of education does not exists, and (b) it is possible to develop it (for me – I am positive that it is possible at least for STEM subjects /we have an example when an art has been gradually transferred into a science – the game of chess/; I am not an expert in other areas, however, I would expect that there are common principles which work for any subject). Hence, I have a long list of people in various spheres (officials, charity officials, venture capitalist, etc.) to whom I am trying to reach out. I am in the process of a consensus building. It might take weeks, or months, or years, I do understand this. However, I see only two scenaria. I. When the project finds sufficient support and will be ready to be launched into the next phase, all credits for that will be just mine, Boston University will not have anything to do with it (like the patent bureau where in 1905 Albert Einstein wrote his papers has nothing to do with the special relativity theory – I am not compering myself with AE, I am using this example as a clear analogy). II. or it will be I and Boston University together (even if initially we were not exactly on the same page). 3. I would not describe my emotion as frustration, at least that was not intentional. I would rather say I feel some disappointment. But my hope is that I am not alone who is disappointed with the current state of education (for example, considering how the funds put into it). I want to thank you again and to express my appreciation, and to invite you to physics department Pumpkin Drop which happens today at 12!